MAKE AN OFFER!!! 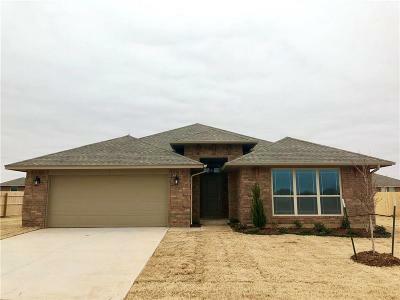 Fall in love with this amazing NEW home in Chickasha! The barreled ceiling entry leads to a large living room that boasts a cozy fireplace and plenty of room for entertaining. The kitchen is a chef's paradise featuring gorgeous custom built wood cabinetry, stainless steel appliances, a large island offering lots of extra quartz counter space, elegant upgraded back splash, and accented with under cabinet lighting! A giant master bedroom with tray ceiling leads to a spacious private bathroom featuring a door-less walk-in shower, walk-in closet, and a separate garden tub! The master closet also connects to a utility room for convenience, giving this versatile floor design a very nice flow. Spacious utility room features a handy mud bench! The long covered back patio is perfect for entertaining with added privacy with the fully fenced backyard! 1 year builder warranty, and 10 years structural/foundation warranty included!